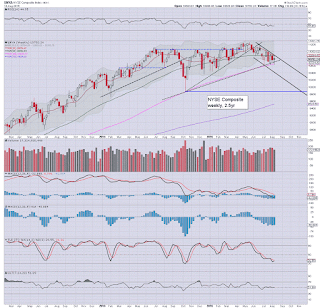 US equity indexes saw a week of rather dynamic swings. 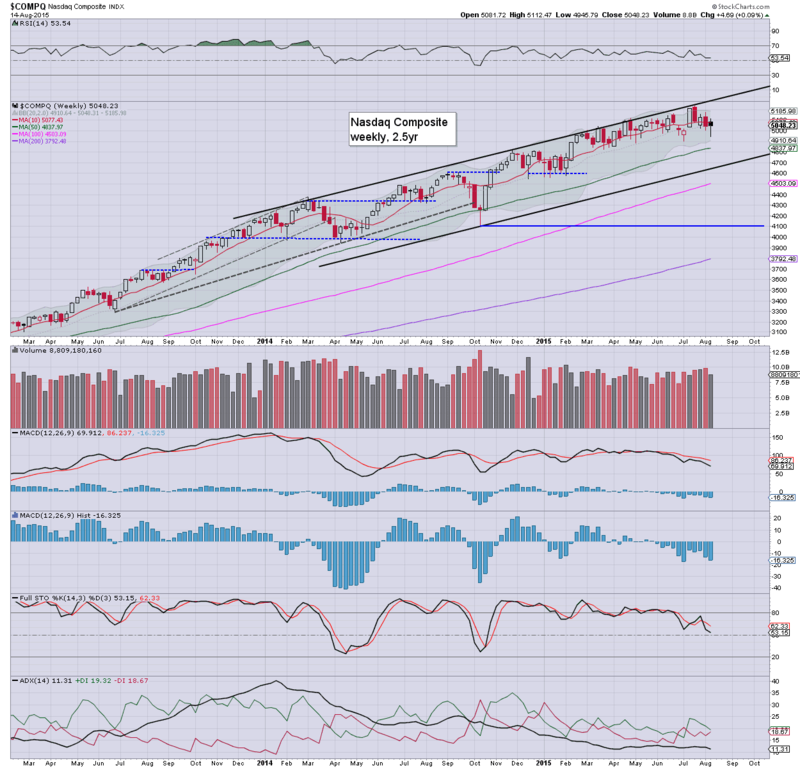 Net weekly gains ranged from 0.8% (Trans), 0.5% (R2K), to 0.1% (Nasdaq comp'). Near term outlook offers threat of some moderate gains/chop into Aug' opex, but then very sig' downside into Sept'. 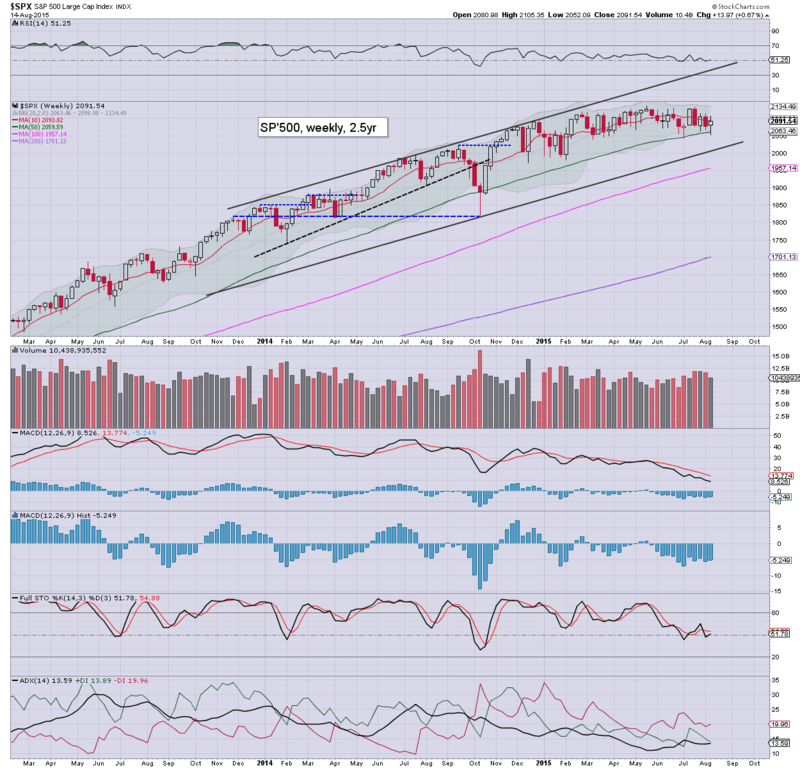 Having swung from a Monday high of 2105 to a Wednesday low of 2052, the sp'500 saw a net weekly gain of 14pts (0.7%), settling at 2091 Underlying MACD (blue bar histogram) cycle ticked a touch higher, but has now been negative cycle for 12 weeks. First key support is the giant 2000 threshold. In terms of upside, there are multiple aspects of resistance in the 2130s. Best case for the bulls appears to be a brief break to 2110/20s... new historic highs look out of range. Best guess... renewed downside to the sp'2040s in the near term... a moderate bounce, and then the 2000 threshold being broken in late Aug/early Sept'. The tech' was the weakest index this week with a fractional net gain of 0.1% at 5048. First key support is the giant 5K threshold. That looks set to fail at some point in the next 1-3 weeks. 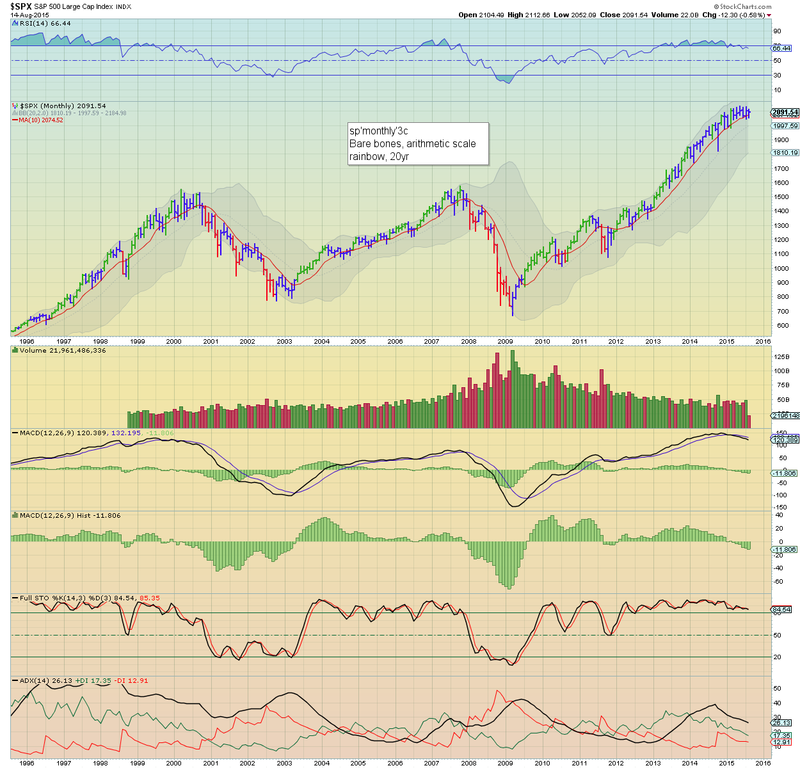 From there.. downside to at least 4700.. which is a clear 6% lower... equiv' to sp'2000/1980. The mighty Dow saw a Wed' low of 17125, but settled +0.6% @ 17477. 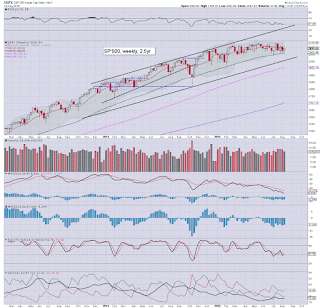 A test of the 17k threshold looks a given.. with eventual downside by early Oct' to the 16500/16000 zone. I do not expect sustained action <16K in the remainder of this year. 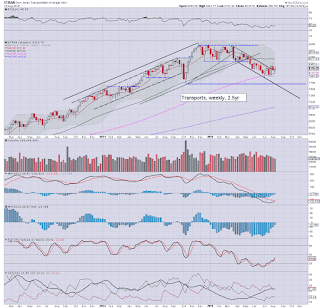 The master index (as I still like to call it) settled +0.2% @ 10782.. with a black-fail candle. 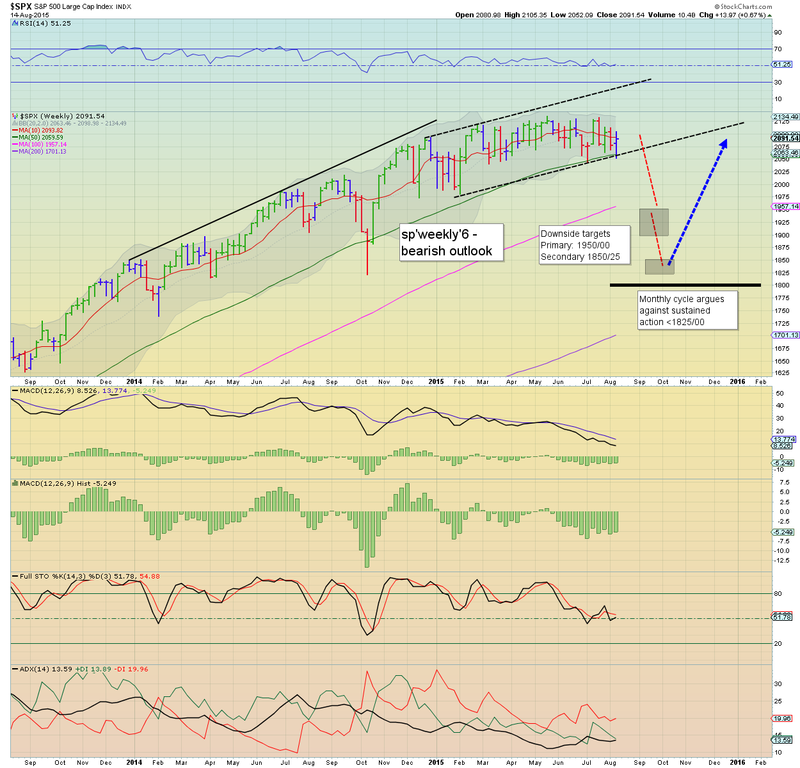 Broadly, the 10500s look an easy target within the near term. A sustained move back above 11k looks highly improbable. 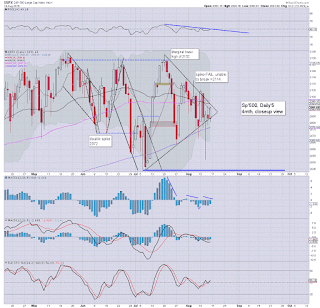 A particularly bearish target for late Sept/Oct' would be the 10000/9800 zone. The second market leader saw a swing from 1189 to 1212, a net gain of 0.5%. Best case for the bulls is a move back to the 1240s, but that will merely make for yet another lower high. 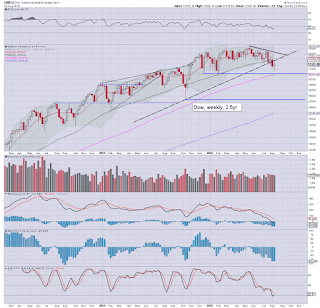 Broadly, the R2K looks set for 1100 within the next 3-7 weeks. 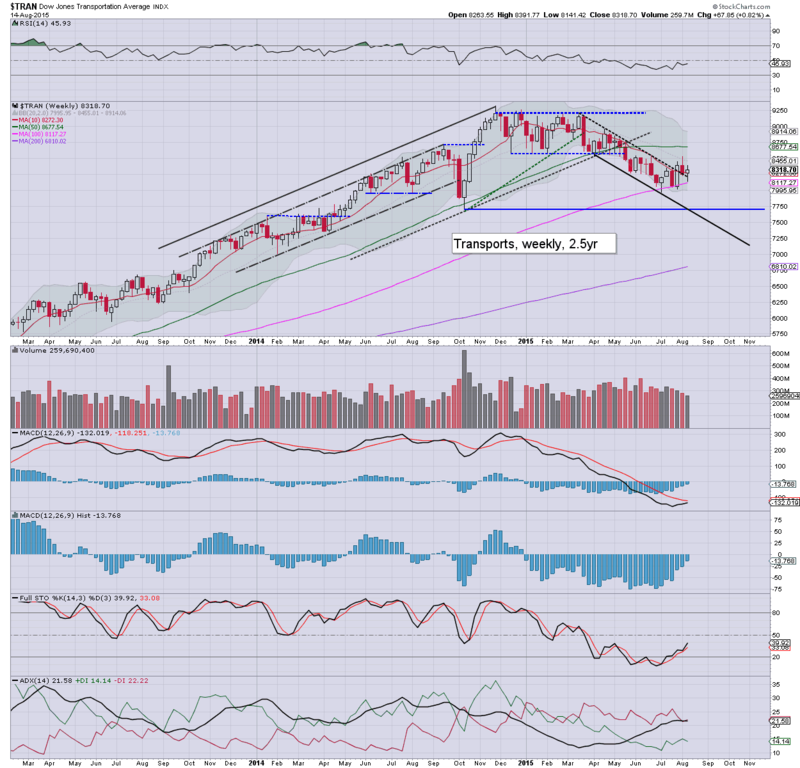 I do not expect the Oct' 2014 low of 1040 to be broken under... on any 'realistic scenario'. 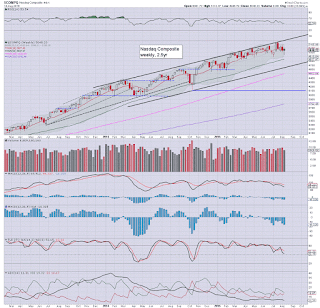 So.. net weekly gains for all the indexes, having battled higher from the Wednesday morning low. Yet, the closing weekly candles aren't particularly bullish. 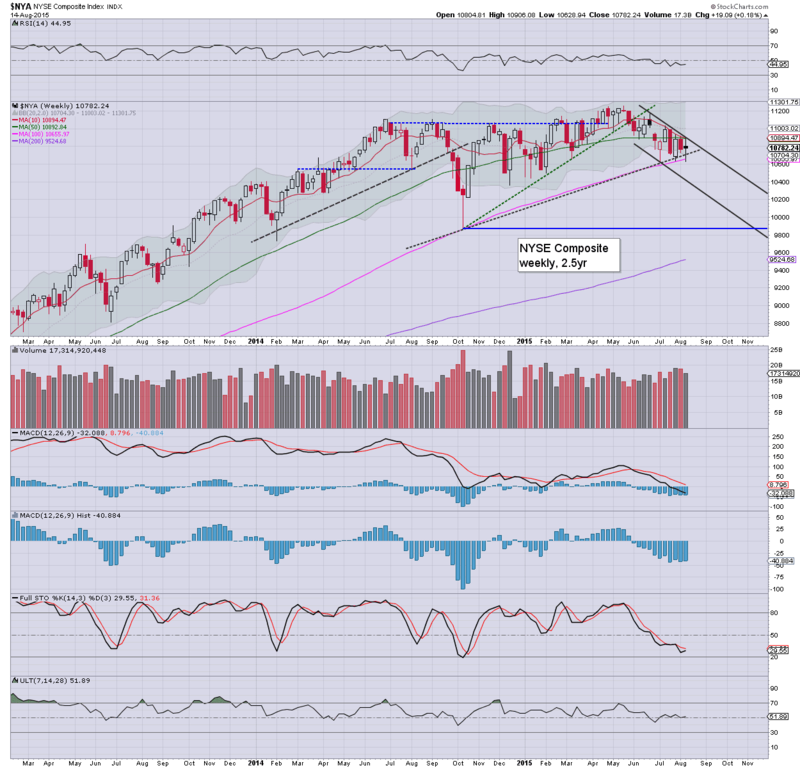 Indeed, most indexes merely saw yet another lower high and lower low. Regardless of any moderate upside into the coming OPEX, it seems highly unlikely any of the indexes can break new highs in the near/mid term. 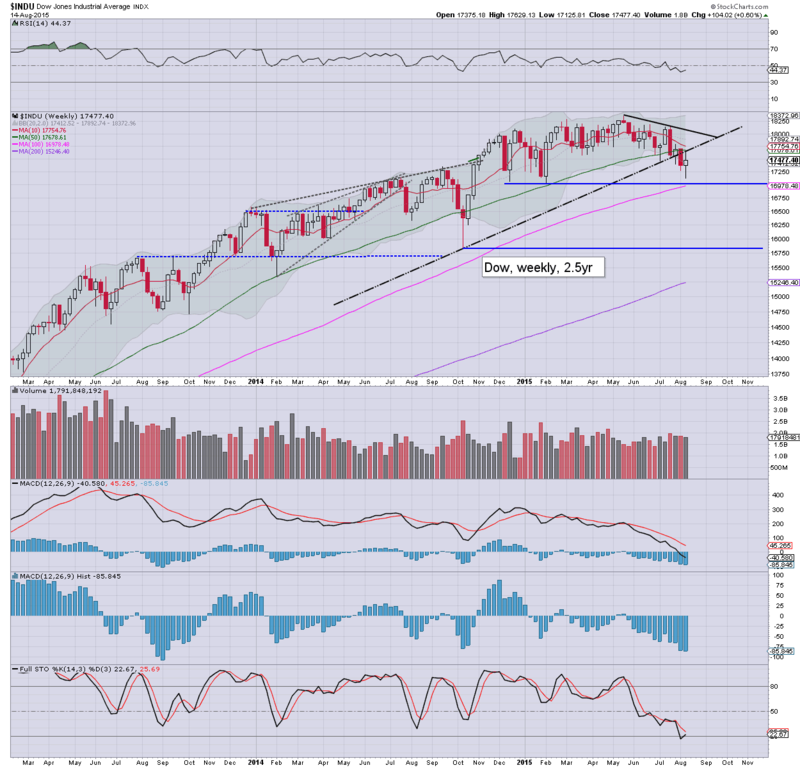 Broadly, all indexes look set to fall at least 5-7% between now and late September. However, if we're in some sort of 'intermediate' correction, then we'll soon break much lower... at a rather accelerated rate. 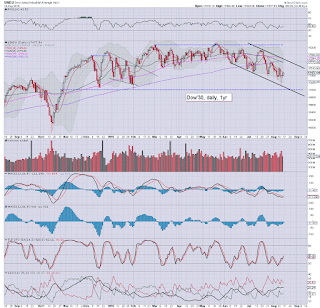 Best case for the equity bears is a test of the Oct'2014 low in the low sp'1800s. From a time perspective, the window of opportunity will likely close in the first week of October - which tends to be a seasonal low. Much like the past week, there really isn't much in the way of scheduled data. Yours truly has once again been too early on a market re-short. Having bailed (perfectly, I dare say) from VIX 16.20, I'm now underwater as the VIX is back in the 12s. As things are, I can cope with holding into Aug' opex, and beyond. From a pure technical/cyclical perspective, price momentum increasingly favours the equity bears. As we move into late August/early Sept', I would imagine we'll be seeing stronger and more sustained downside, with VIX breaking into the low 20s. 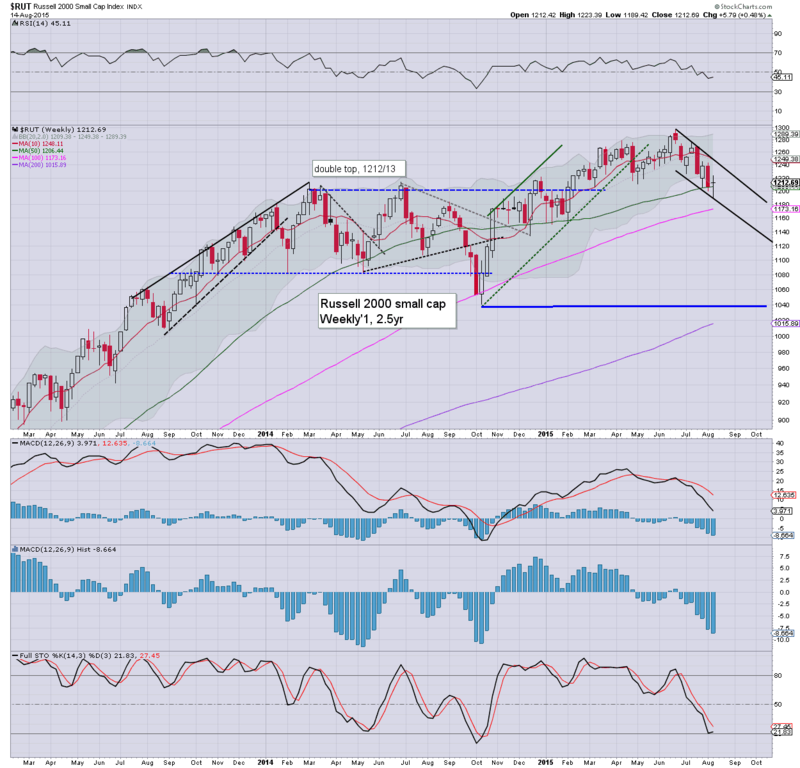 Whilst equities saw a moderate net weekly gain of 14pts (0.7%) at sp'2091, on the bigger scale, we have a rather clear rounded top.. having peaked at sp'2134 in May. 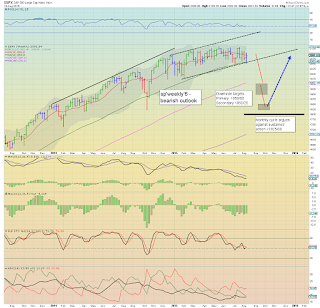 A break under the key psychological threshold of sp'2000 looks due, from there.... things should get real interesting. *a blue candle on the 'rainbow' weekly cycle. It is notable that on Monday it was green... but flipped to red Tue/Wed. 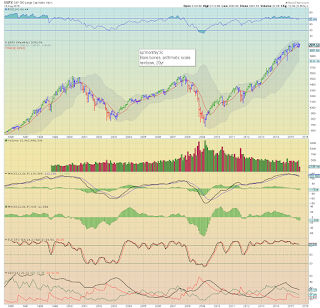 So... do we really have a big giant rounded top on the sp'500? 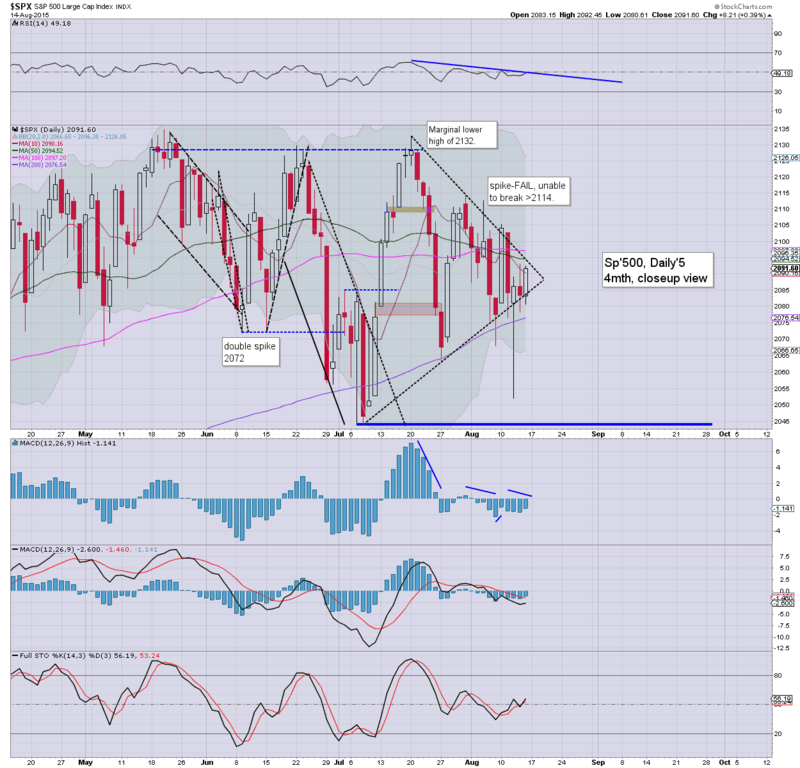 I remain looking for some significant weakness into September... and perhaps some of October, but broadly.. I am seeking renewed upside into next year. 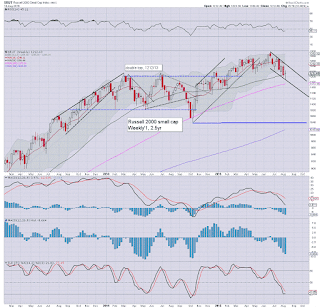 US equities ended the week on a moderately positive note, sp +8pts @ 2091. The two leaders - Trans/R2K, both settled higher by 0.6%. Near term outlook remains unchanged, with renewed weakness, ideally to the sp'2040s, with Dow 17000, and that should equate to VIX in the 17s. Despite a net daily gain to end the week, it remains a series of lower highs and lower lows since most indexes peaked in mid May. 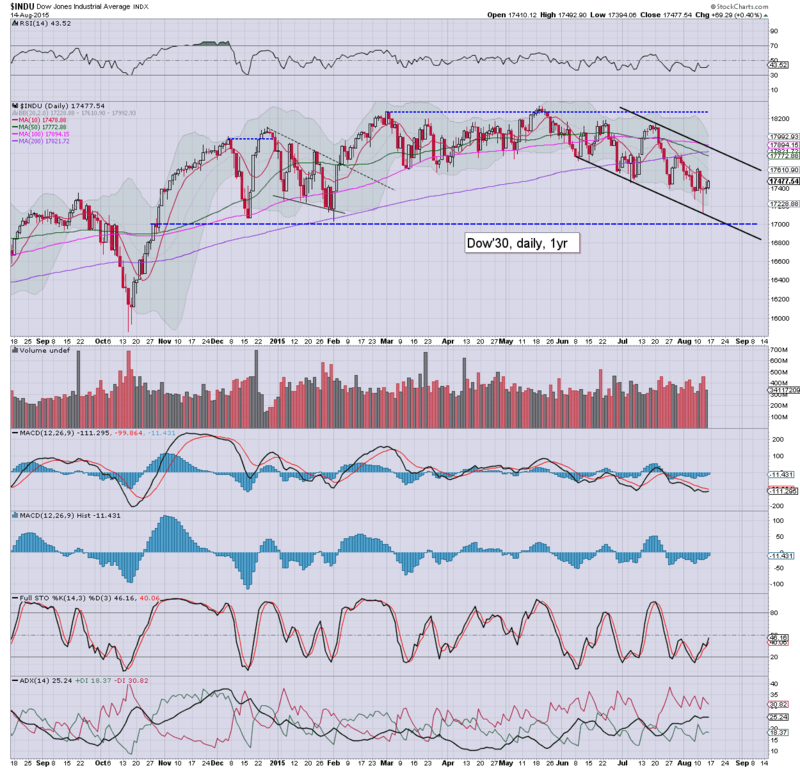 Renewed downside looks due next week.